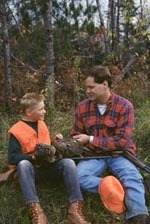 All persons born on or after January 1, 1975 must first successfully complete a certified hunter education course before purchasing a hunting license. (Chapter 20-2-30a WV Code) When purchasing a hunting license, the person must present a certificate of completion to the agent issuing the license. The first hunter education class taught in West Virginia was in 1968. It consisted of a short talk and a movie. In 1971, West Virginia won the NRA award for outstanding contributions to the field of hunter education. Today the course takes an average of 12 hours to complete. Over 360,000 students have passed the course since it began. This could not have been accomplished without the help of over 500 trained volunteer instructors who donate hundreds of hours and thousands of miles each year. Be sure of your target and what's beyond it. Be sure the barrel and action are clear of obstructions. Unload firearms when not in use. Never point a firearm at anything you don't want to shoot. Never climb a fence or tree or jump a ditch with a loaded firearm. Never shoot a bullet at a flat, hard surface or water. Store firearms and ammunition separately. Avoid alcoholic beverages and other mind altering drugs before and during shooting. Lost your hunter education card? completing the hunter education class we will return your $10.00.